Eight-year-old Cooper plays baseball, football and basketball at the Y. In a recent interview, Cooper explained why he would recommend Y sports to other kids. “I would tell them to sign up for this because it’s really, really fun, and you get to make new friends!” (Cooper’s Story). That is the essence of what we’re trying to do at the Y. We do not want to groom the top half of one percent, to be that much more exceptional. We want to help the bulk of our kids learn life lessons, and build character and leadership skills. We often forget that social and emotional learning outcomes are magnified through participation in youth sports. But there are two current challenges: access and equity. I’ve got kids who have both played AAU basketball. On my son’s schedule this spring and summer: Sioux Falls, Des Moines, and likely Virginia or Kansas. As a dad, it’s fascinating. At a very young age, he gets to see different parts of the country, and compete with athletes from all backgrounds. Those are positives. But what about the barriers for many others? It’s expensive: $500 registration, then traveling on weekends, which includes hotel, dining and transportation costs. Often, such opportunities are earmarked for kids who play at a very high level, and are extremely competitive. That, in itself, takes many kids out of the equation. In the age of sports specialization, it’s almost an arms race of investing in youth sports but at the very tip of the pyramid, for just a tiny percentage of kids. In Outliers, author Malcolm Gladwell notes that the best athletes also get the best training, coaching and gym time. All of the opportunity goes to a select few. Instead of the tip, the Y wants to provide access to each part of the pyramid, particularly with a great foundation to the hundreds of thousands of kids who are falling out of sports too soon. We are working to level the playing field, pun intended, to give kids access — regardless of skill level or ability to pay — to have access to caring adults, and fantastic coaches and instructors who are helping them engage, and continue to benefit from individual and team sports. We look at all the benefits of being engaged as a student-athlete: Learning how to win, learning how to lose, learning about healthy competition. And if you lose, what were the drivers of that outcome? Could you have worked harder, could you have been more unselfish, could you have been a better teammate? We need to keep providing kids an opportunity to play and not weed them out because they are not “elite.” If youth sports becomes a one- or two-year experiment for a kid, he or she may feel like a failure because of ill-placed expectations. Each year affords an opportunity for a student-athlete to learn from a different coach, learn on a deeper level how to win and lose with dignity, learn from mistakes and setbacks. How does that cascade to confidence going forward? Will they be as willing to take a risk at other things they love? Because, in reality, failure comes almost daily for us as an adult. Studies show that youth in sports are more likely to succeed in school and develop important social-emotional skills like goal-setting, self-esteem and leadership. Locally, data out of Minneapolis Public Schools says that 90 percent of student-athletes graduate, significantly higher than students who do not participate in sports. 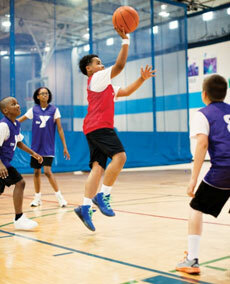 Our team at the Y understands that participation in youth sports is a means to the end. Sports are not life but rather, sports are a part of life.